On June 7, 1906 William S. Gehr of Wenatchee, Washington, his wife, Emma, and their dog, Snip, along with friends William Edward Camfield, wife Nellie, and 8-year-old son William Jr., boarded a Model E Glide for a cross-country jaunt from Wenatchee, about a hundred miles east of Seattle to New York City. “This is not a speed record,” Mr. Gehr proclaimed. “It’s a recreation trip.” But as the papers quickly noted, it was the first transcontinental attempt that included several women, a child, and a family pet. Mr. Gehr was right on. The family had no intention of making any time constraints. They casually made their way across country, camping, fishing, hunting, and generally enjoying the great outdoors. If there was a breakdown, they would stop and enjoy the apparent respite, oftentimes staying put for several days just for rest and relaxation. Eventually, the papers caught on. This was no race; this was a vacation—the first family road trip. On October 13, after spending nearly four full months on the road, the two families rolled into Peoria, Illinois, “tanned to a ripe berry color and with clothes and features coated with Illinois dust,” the Peoria Herald-Transcript reported. Illinois was certainly on the route, but Peoria was special for another reason. It was home to the Glide. Peanut roaster turned car maker, Jay Bartholomew didn’t let the opportunity slip by. He formally greeted the families in Princeville and escorted them to Peoria. “The travel-worn machine demonstrated its friskiness in covering the twenty-five miles to Peoria in a trifle over an hour,” the papers praised. When they arrived in front of the Bartholomew Glide factory, they were greeted by a large crowd and a rousing applause. Mr. Gehr was an animated interview. While traveling in South Dakota, he told reporters, torrential downpours turned the road into an impossible “morass of gumbo.” They waited in the comfort of hotels until the weather cleared. Before that, in Yellowstone, a bear snatched their morning bacon. “The only adventure with wild animals,” Gehr explained. And in Montana, a group of Indians near the Flathead River laughed at their predicaments at first but eventually used their saddle horses to extricate the vehicle’s wheels from a deep hole. Then a farmer lent them a cowhide to patch a flat. In Iowa, Gehr concluded, the travel was “fine,” hampered only by a stiff wind in Davenport that caused a brief delay. The families were expected to stay in Peoria only a few days, but that turned into a full week before they set off again. The ambitious plan was to go to New York and complete the west-to-east journey, then travel to Washington, D.C., and south to Florida. Later, they would go to Mexico, taking their leisurely time along the way. But Bartholomew had other ideas for his now nationally recognized endurance machine. A large auto tradeshow was coming up in New York City, and Bartholomew wanted the Gehr’s’ Glide to be a prominent feature. Whether the rich entrepreneur paid the families or just used his power of persuasion is not known. The Gehrs apparently agreed to the proposal, although it clearly meant big changes in their schedule. Now they had a deadline to meet. The big auto show was in December. For the first time in their long journey, the Gehrs were in a hurry. On November 23, the two families drove into Linesville, Pennsylvania, an impressive feat for sure, but still some 400 miles from their destination. Just five days later, on the 28th, the Glide made it to New York City, but the Gehrs did not. For reasons only explained by their obvious intent to get the vehicle to New York City within days, the roadster was loaded onto a railcar and shipped to the Big Apple instead. The Grand Central Palace Auto Show opened on December 1. They never would have made it on time. When the Glide arrived in New York City, Bartholomew never let on. He had his showcase vehicle on display and the Gehr’s bold American road trip was over. Even the New York Times was duped. 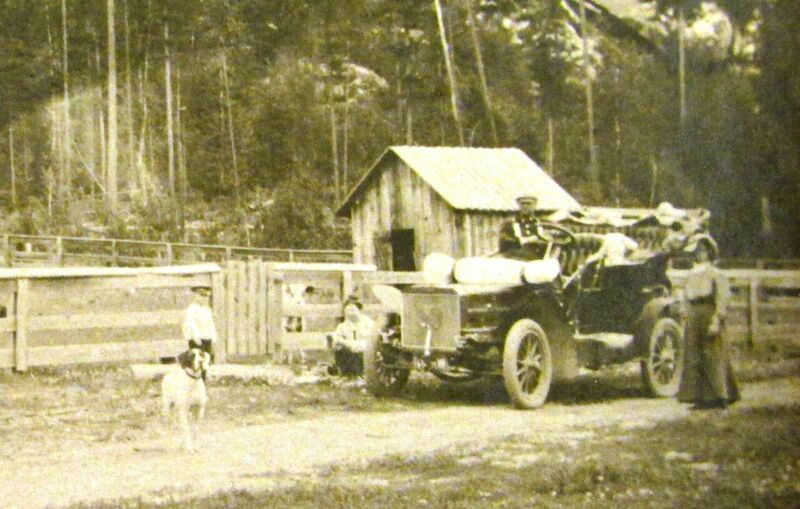 “While automobiles have previously crossed the continent,” the paper gushed, “this is the first time that the journey had been successfully accomplished by a regular touring car carrying its full compliments.” The paper also pointed out that it was the first time the journey had been completed by women as passengers, two in fact, or three if you count the dog. Later, Emma Gehr’s journal would confirm any suspicions. They never made it all the way to New York, she stated, which would have truly constituted a transcontinental trip.